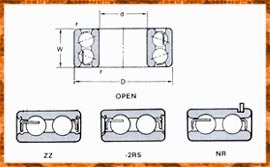 This series is used in the instances of heavy radial loads, combined radial and thrust loads and two directional loads. The non-filling solt allows these bearings to be used at high RPM. In addition, the angle of contact converges outside the bearing, offering increased resistance to overturing moments. .